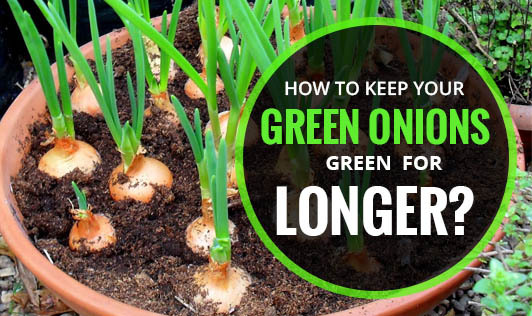 How to Keep Your Green Onions Green for Longer? Green Onions also known as scallions or spring onions are a wonderful addition to a range of dishes and cuisines. But the major problem is the storage of these onions. They hardly stay fresh for a day or two in the fridge. 1. To store better, wrap the green onions in a wet paper towel and cover it in a plastic cover before storing it in the fridge. 2. If your green onions have already lost moisture and are limp, soak them in an ice water bath for 15 to 20 minutes. This brings back the freshness and lustre. 3. You can store frozen green onions. Wash, dry and chop them and store them in re-sealable packs. Add these frozen green onions to your dish at the end of cooking. They defrost immediately. If you are adding them too quickly they may become mushy. 4. You can also re-grow chopped green onions. Put in a water jar with roots just immersed. Place them on your window sill and pour water when the levels are low. The onions continue to grow for a couple of weeks. This cannot work indefinitely as the green onions lose out on taste and flavour with few cuttings. 5. Another way of storing green onions is by drying. Dry green onions and store them in air tight containers and use them when you need it for your favourite cuisine.